Summary: The northernmost island in the Kodiak archipelago, Shuyak was designated a state park after the 1989 Exxon Valdez oil spill. A quarter-century later the oil on its shores has been replaced by marine debris. Five ITN clean-ups over the past eight years have resulted in the removal of over 65,000 lbs of marine debris from this otherwise pristine shoreline. A volunteer transports marine debris by canoe from a beach to a staging area. Shuyak Island State Park comprises most of the island's 47,000 acres and is only accessible by boat or plane. The island is a remote but popular recreational destination and supports a relatively pristine and thriving marine ecosystem. The legislation creating Shuyak Island State Park cites fish and wildlife habitat protection as one of the primary objectives for creating the park. The park encompasses a largely undisturbed coastal Sitka Spruce forest ecosystem that is unique to the area and supports the oldest spruce forest in the entire archipelago. 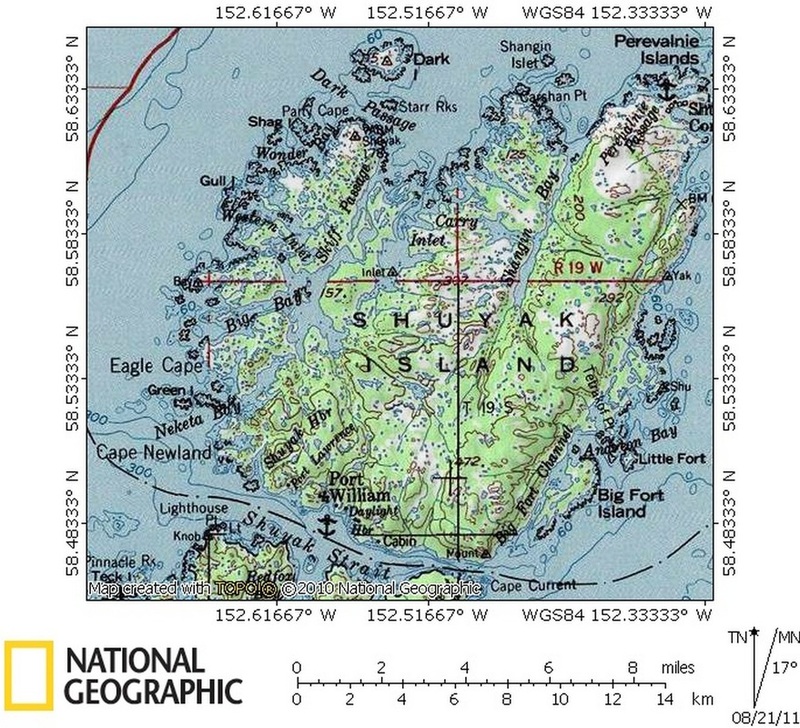 Shuyak Island's compact dimensions measure 12 miles long and 11 miles wide, but contain many more miles of sheltered interior waterways than anywhere in the archipelago. The approximately 60 miles of coastline on Shuyak includes a series of protected bays, coves and inlets, intervening rocky shorelines, headlands and off-shore reefs that offer limited beach access. Shuyak is rich in biodiversity and provides critical habitat to many species of nesting birds, harbor seals and other marine life. Shelikof Strait and the Gulf of Alaska Current all influence the oceanographic and biological conditions in the area. The mixing of tidal streams at the north end of Shuyak Island creates an environment that is rich in nutrients and food for marine mammals, seabirds and other marine life. Shuyak’s coastline is an intricate maze of protected bays and passages consisting of extensive estuarine wetlands and a variety of gravel and rocky beaches. The island is dissected by a series of interconnected bays and passages; thus events in one portion of the island tend to impact the entire island system. Waters on the northwestern side of the island are shallow, highly tidal and only navigable in small boats during high tide. Shuyak was one of the more severely damaged areas by the 1989 Exxon-Valdez oil spill. Many beaches were heavily oiled and littered with dead birds and sea otters. Twenty-five years later, these populations are still recovering, but now face threats from beaches littered with marine debris and plastic pollution. Alaska’s world class fish stocks are at risk from the cumulative effects due to the ingestion of toxic chemicals and micro-plastic particles. Shuyak Island's uplands include hundreds of small lakes and beaver ponds fed from runoff, springs and seeps. These interior wetlands form the watershed sources that feed many small creeks and waterways that include at least 18 anadromous fish streams that are important for both commercial and sport fishing. Marine and fresh waters of the Afognak/Shuyak Island group comprise the third most popular sport fishing destination in the Kodiak Management Area of the Alaska Department of Fish and Game. The Alaska Department of Fish and Game management objectives for salmon around Shuyak include both harvest and escapement to maintain current stocks. Since 1990, these waters have accounted for nearly 11% of the recreational angling effort expended in the Kodiak Management Area. The two major fisheries in the area target coho salmon and halibut. Marine mammals found on or around Shuyak Island include sea otters, harbor seals, Steller sea lions, orcas, dall porpoise, and orca, minke, fin, gray and humpback whales. The sea otters commonly seen around Shuyak Island are part of the southwest population of northern sea otters that was listed as Threatened under the Endangered Species Act in 2005 due to precipitous population declines. Harbor seals regularly haul-out in the northwest corner of Big Bay. Stellar sea lions, fin and humpback whales are also federally threatened species. Approximately 121 species of birds have been observed on Shuyak and surrounding islands in the northern portion of the Kodiak Archipelago. Shorebirds and seabirds migrate to Shuyak during the summer months to breed and make use of the abundance of food available in the ocean currents at the north end of the island. Many of the bird species that suffered a population decline due to the Exxon-Valdes oil spill are found in large numbers on Shuyak and include bald eagles, harlequin ducks, black oystercatchers, pigeon guillemonts, common murres and marbled murrelets. Marbled murrelets remain on the Alaska Audubon Watch List as a species of conservation concern due to declining numbers in the Lower 48. The black oystercatcher is a US Fish and Wildlife Service focal species for conservation action due to its limited range and threatened habitat. The Kodiak Archipelago is home to approximately 1,500 individuals, estimated to be about 10% of the global population. Black oystercatchers have been known to nest in marine debris and marine pollution is one of several factors contributing to the decline of marbled murrelets. Shuyak also has a small breeding colony of Aleutian and arctic terns that belong to a declining Alaskan population closely monitored by the US Fish and Wildlife Service. Just twenty-five miles away, the Barren Islands is an Important Bird Area (IBA) that is an internationally recognized and globally significant area for over 50,000 breeding tufted puffins. 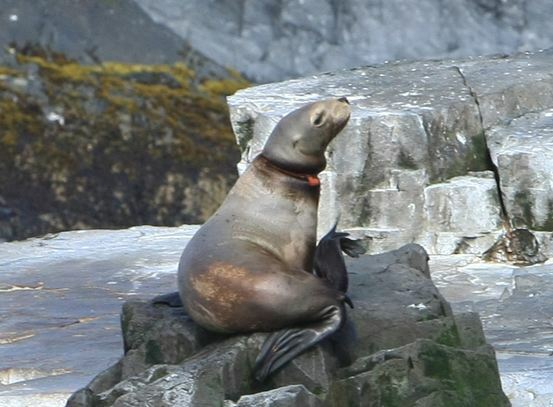 Endangered Steller sealion entangled in marine debris, Kodiak island. Marine debris is a widespread phenomenon that has impacted numerous beaches in the Gulf of Alaska. In 2013 a Marine Debris Prioritization Scheme was conducted by NOAA and ADEC for the Gulf of Alaska. The survey identified gave Shuyak Island a a rating of 4.5 out of 5.0, with 5 being the worst affected by marine debris. This rating is among the highest in the Kodiak area as well as other regions of the Gulf of Alaska. The project site has some large to medium pieces of debris, large stretches of uninterrupted deposits of marine debris, flotsam and/or driftwood. The 2013 assessment indicated the presence of up to 60,000 lbs. of marine debris scattered along the beaches. Although 30,000 lbs has been removed since then, re-accumulation rates of marine debris on area beaches are believed to be already high, and possibly increasing. The composition of the marine debris on Shuyak is estimated by ITN to be approximately 30-50% derelict fishing gear, 10% metal material and 40% plastic waste. The project site is exposed to high wind and strong currents allowing for adhesion and accumulation of marine debris. The unique features of the project site include coastline that make it likely that the large and medium sized marine debris will remain in one place after coming into contact with the shoreline. These distinctive conditions provide the opportunity to remove large non-re-accumulating marine debris that is currently negatively impacting important marine habitat. ITN first went to work on Shuyak island in 2008 under a grant from the Alaska Marine Stewardship Foundation. Our first large scale remote clean-up was a ship-based operation comprised of eight adult volunteers from around U.S. The clean-up yielded 4,700 lbs of marine debris from northwest-facing Dead Bird Beach (so-named because of the high numbers of oiled murres found there after Exxon), and 2,400 lbs on Red Buoy beach in the northeast. In 2009 we returned with a group of volunteers Columbia Preparatory & Grammar School on a trip to Kodiak for conservation internships. This crew removed 4000 lbs of marine debris out of three distinct areas including 1500 lbs from Dead Bird beach, which had been completely rid of marine debris the previous year. By contrast our inspection of Red Buoy beach showed it to be relatively clean and absent of new deposits, indicating that rates are erratic and may be subject to prevailing wind and wave direction in a given year. The CGPS partnership was so successful we repeated the Shuyak clean-up in 2010 before moving on to other areas in successive years. The 2010 crew the crew collected 5313 lbs of marine debris including 1200 lbs from Dead Bird beach and 4115 lbs from a craggy section of coastline just southwest of Carshan Point, one of the most exposed sections of the park. We returned to Shuyak in 2014 with funding assistance from the State of Alaska and government of Japan as part of statewide Japan Tsunami Marine Debris cleanup. That year we used a professional crew of 12 to clean-up of the highly exposed east side of Shuyak, removing over 20,000 lbs from just south of the Perevalnie islands to the southern tip of Big Fort island. Toward the end of the clean-up crews discovered and helped return the body of French adventurer Francois Guenot. In 2016 with the help of a grant from NOAA, we worked the west side of Shuyak, starting at Eagle Cape and working northward to Wonder Bay. With crews camping in tents and public use cabins, and accessing the beaches every day by Kayak, we removed 190 cubic yards of marine debris weighing 35,036 lbs. This effectively removed all marine debris from 45.1 nautical miles of shoreline. We hope to return to Shuyak and complete the segment of coastline from Wonder Bay to Point Banks, the last segment of Shuyak that has not been completely rid of marine debris since 2014 (with many thanks to Blue Fox Bay Lodge, who has cleaned up south Shuyak along Shuyak Straits in addition to extensive coastlines of northwest Afognak).